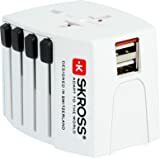 Do I need a travel adapter for a trip to the Republic of the Congo? Yes, you need a travel adapter (plug adapter) for a trip from the United Kingdom to the Republic of the Congo. In the Republic of the Congo, people are using different plugs and plug sockets that are not compatible with plugs from the United Kingdom! The Republic of the Congo is a country in Africa (Middle Africa) with about 4.8 Millionen inhabitants on an area of almost 342 000 km². The capital of the Republic of the Congo is Brazzaville (1.1 Millionen inhabitants). People in the country are mainly speaking French, Kongo and Lingala. The neighbors of the Republic of the Congo are Angola, Cameroon, the Central African Republic, the Democratic Republic of the Congo and Gabon. Which types of plugs are used in the Republic of the Congo? The Republic of the Congo uses plugs of type C and E. Plug sockets of type G, which are common in the United Kingdom, are not in use in the Republic of the Congo. What is the Electricity Voltage in the Republic of the Congo? The voltage in the Republic of the Congo is 230 volts. The voltage, therefore, is equal to the 230 volts in the United Kingdom. This means that you can use all your electrical appliances without any problems. What is the utility frequency in the Republic of the Congo? The utility frequency in the Republic of the Congo is 50 Hertz. The frequency, therefore, is the same as in the United Kingdom. That's why it is safe to use all your electric appliances in the Republic of the Congo.